With its windshield shot full of bullet holes, the automobile of Theodore Simons, gas station proprietor, which was taken from him at gunpoint by a lone bandit last night, was recovered by deputy sheriffs this afternoon, abandoned near Warners. The bullet holes are believed to have been made by the gunman, shooting from the driver’s seat. His target remains a mystery. The car was taken from Simons along with $100 in cash when he arrived at his filling station at Montrose Avenue and West Genesee Street, just after the robber had taken $45 from the attendant, Donald Schultz, 16, of 216 Erie Street. Whipping the revolver from his pocket, the robber forced Simons to hand over $100, then ordered him from the car. Jumping behind the wheel, he sped away, vanishing down the West Genesee Street turnpike. Police are searching for a young, well-dressed gunman who held up Charles W. Post of 306 Fabius Street, attendant in the gasoline station at West Genesee Street and Charles Avenue last night, robbed him of $30, cut all telephone wires and escaped in Post’s new roadster. The gunman sped toward Fairmount after the daring holdup. Pulling a revolver on Post, the stranger first disarmed the attendant. Post had a revolver given him recently by his employer, Theodore Simons, after the latter was held up several months ago by a man answering the description of last night’s intruder. Post was the only attendant on duty when the youth, described as an American of about 21 years of age, walked into the station and pulled out the revolver. The attendant was forced to throw up his hands before he could reach for his own weapon, and then watched the intruder clean the cash register of $30. The gunman then ordered Post to stand still in the station. He went outside, cut telephone wires, jumped into Post’s new roadster, conspicuously painted in bright blue and orange, and sped from the scene. Post ran to a nearby station and summoned police. The attendant said the gunman wore a long blue coat and a brown felt hat. He had a small mustache. Police are searching for Post’s roadster, believing the gunman abandoned it soon after his escape because of its conspicuous color. Post's colorful car probably was recovered, but I found no mention of it. The fact the robber (or robbers) had been successful both times made one employee vow he would not allow it to happen again. Later co-workers would recall James Bixby's reaction to the second robbery: "That guy'll get away over my dead body if he ever shows up when I'm around." From a bed in St. Joseph Hospital where he is grimly fighting for life, suffering from a critical abdominal wound and two other gunshot wounds, James Bixby, 21, of 501 Montrose Avenue, Solvay, a gas station attendant, today whispered to police investigators the details of a gun battle he waged against a bandit early this morning. Only three feet apart, the bandit and Bixby emptied their guns at each other. Whether any of Bixby’s shots found their mark is not yet known. He told police he fired his gun point-blank at the holdup man. He expressed conviction that at least one of the bullets had taken effect. The statement Bixby made in St. Joseph Hospital to clerk Charles Edick was the first tangible clue furnished police on which to base their hunt for the bandit who held up a taxi driver, stole his machine and then attempted to stick up the gasoline station early this morning. A county-wide search for the man had proved fruitless at a late hour this afternoon. Neither Bixby nor Albert Hemming, 203 East Raynor Avenue, the taxi operator, was able to furnish police with a detailed description of the bandit, believed to be the same man whose robberies of various gasoline stations in the vicinity have baffled police for a month. He may also be the man who robbed this particular gas station twice before last night's visit. Bixby, suffering from a bullet which penetrated his abdomen, plus wounds in the hip and a leg, told Edick he was alone in the station when he noticed the cab pull up to one of the gasoline pumps. Bixby at first believed the entire proceedings a practical joke and that the gun was a novelty cigarette case. Laughingly he reached into his pocket for his own revolver, a .32 caliber weapon. As he moved his hand, the bandit suddenly opened fire. Bixby returned shot for shot, emptying his gun at the holdup man. He retreated toward the back of the car. As he moved backwards his assailant leaped from the machine and took to his heels. Bixby became faint and collapsed. It was not until he was revived at the hospital that Bixby realized he had been wounded in the abdomen. Until then he believed he had been shot in the leg only. This noon when police went to the gasoline station they found a cap in the driveway. It bore the label of an Auburn haberdasher. They expressed the belief it was either the property of the bandit or of Merrit Way of Newark (NY), who was wounded a week ago when he attempted to interfere with a gasoline station holdup at Seneca and South Salina Streets. That robber is believed to be the same man who shot Bixby. According to stories related to police this morning, taxi driver Albert Hemming was approached by a man about 25 years old shortly after he had left a passenger at the New York Central station [in downtown Syracuse]. The man climbed into the rear seat of the cab, gave Hemming an address in the 1800 block of West Genesee Street and engaged the driver in a conversation on commonplace subjects while he drove to the address. In the meantime, Hemming had driven to a lonely spot several miles away on the Fairmount road at the bandit’s orders. Suddenly the thug changed his plans. He ordered the car stopped and then, with practiced fingers, calmly and thoroughly rifled Hemming’s pockets. He secured $10 in cash and an expensive watch. He ordered Hemming out of the cab and quickly slid behind the wheel and drove off toward the city at a rapid clip. The man stopped at the gas station at Montrose Avenue and West Genesee Street, scene of a holdup last October and again two weeks ago. In the recent holdup the bandit stole the car of another attendant, after rifling the till. Bixby, who works from 11 p.m. to 7 a.m., was on duty alone. He recently avowed that if a bandit appeared at the station while he was on duty that he would fight him to the end rather than allow the robber to continue his work unimpeded. Shortly after the gun duel, Raymond Pollack [Pawlick] stopped at the station to buy gasoline. He found Bixby unconscious near the pumps and took him to St. Joseph Hospital, later notifying police. Meanwhile, Hemming, who was hiking back to the city, reached a home from which he made a telephone call to his taxi company to tell them what had occurred. Another cab and several policemen were dispatched to Fairmount to pick him up. They noticed his car parked at the gasoline station, but did not see anyone there. Solvay police contacted Detective Louis McMahon at Syracuse police headquarters. A general alarm was sounded to all patrolmen on their beats and a wide search was instituted in the belief the gunman had fled to the city. Later an unidentified informant called police headquarters and told detectives Dillon and McDonald of an incident in a Solvay cafe, which appeared to have a bearing on the case. The caller said a wounded man entered the cafe early this morning, that the bartender had applied first aid after ordering everyone from the building, and that later the bartender had taken the wounded man away in a car. Chief Hunt of the Solvay Police Department personally investigated and concluded there was no truth to the report. Bixby, who has been boarding at the home of G. W. Ostrander at the Montrose Avenue address for the past few months, is in critical condition. He is gradually sinking and physicians this morning were prepared to make blood transfusions in an attempt to save his life. James Bixby died at 2 a.m. the next morning. It was Easter Sunday. During the next few weeks police would question several possible suspects, but the murder remained unsolved. Tragedy aside, the Bixby case took one strange turn after another, and along the way there were several moments that were darkly humorous. From the get-go the news stories lacked or gave short shrift to tiny details that may have been important. Like how did the robber arrive the first time? And the second? Either he was on foot, or he had a partner who waited in an automobile. Did the attendants notice two vehicles driving off? Also, why be puzzled about the bullet holes in the windshield of the first stolen car? The robber simply engaged in malicious mischief, shooting up an automobile for no reason. And if he abandoned the car in the middle of nowhere, that's more reason to believe he had a partner in another automobile. Missing from the story of the third robbery is information about the condition of the taxi cab after the thief fled. For example, were there bullet holes in the door, put there by Bixby's shots? If so, how many? GASOLINE STATION robberies were fairly common, especially at those which remained open until late at night or around the clock. The service station at West Genesee Street and Montrose Avenue was an ideal target, located at the edge of both Syracuse and Solvay, with four getaway routes from which to choose, two of them leading to a maze of roads in a sparsely populated area. One story identified the location as West Genesee Street and Charles Avenue, but Charles Avenue runs north from the intersection, Montrose Avenue runs south. The gasoline station was tucked in on the south side of West Genesee at Montrose Avenue. "West Genesee Street turnpike" was a term used occasionally to denote the road as the main route from Syracuse to points west, but it was not much of a highway by today's standards. One thing is for sure about the third robbery — it was a solo effort by a young man who arrived in a taxi cab he had stolen earlier than evening. Interestingly, this time he escaped on foot and quickly disappeared. WITHIN HOURS police had a suspect in custody, but taxi driver Alfred Hemming was certain this particular man did not hijack his car. Also, despite Bixby's confidence that at least one of his shots had hit the robber, police weren't looking for men who had been wounded. It appeared Bixby had hit the car and either missed his target or had, with perhaps one shot, inflicted minor damage that did not result in much bleeding or require a doctor's attention. Nowhere is there a mention that any blood — except Bixby's — was found at the scene. Also, there is only one mention — by Charles Post, after the second robbery — that the man police were looking for wore a mustache. State police, after a high-speed chase that began 30 miles away near Weedsport, soon arrested a 26-year-old man from St. Johnsville who confessed to 17 thefts. This man, however, used his own vehicle in committing his crimes, a vehicle that was wrecked when he lost control of it while attempting to flee the troopers. The vehicle was loaded with things reported stolen in LeRoy, in western New York. Also found was a .45 caliber automatic, loaded except for one bullet. While the man's recent robberies were west of Syracuse, he had been more active in the eastern half of the state, especially in Montgomery and Herkimer counties. For whatever reason, perhaps a shortage of food during the Depression, the 1920s and early '30s was a bad time for chicken farmers. This particular bandit confessed that his crimes included the theft of more than 400 chickens. Police tried to make a connection with the Solvay gasoline station robbery, and with several others recently committed in Syracuse, but it was almost immediately obvious the St. Johnsville chicken thief had nothing to do with Bixby's death. OTHER SUSPECTS were picked up and questioned in Syracuse, and released. Abruptly the search turned to Detroit where police had found a man in a car stolen in Weedsport on the day of the crime. Why police were hung up on Weedsport was never explained in any way that made sense. Yes, Weedsport is close to Auburn and Auburn is the home of a state prison, and, yes, it is possible a man released from that prison might have purchased a hat from an Auburn haberdasher before returning to his life of crime. On the other hand, that cap found at the murder scene might have belonged to the hijacked cab driver or one of his earlier fares. That Merritt Way was mentioned as the cap's possible owner defied logic. (More on Mr. Way later.) Had NCIS investigator Anthony DiNozzo offered such a theory, Leroy Jethro Gibbs would have given him at least one hard slap on the back of his head. Police continued to theorize about robbers from Auburn, a city located about 25 miles from Syracuse. Police felt Bixby's killer had served time at Auburn Prison and was acquainted with these other robbers, and that perhaps the killer was the man being held in Detroit. A week after Bixby was shot, a state police officer was dispatched to Michigan to bring back the car and the thief, who was quickly ruled out as a suspect. Meanwhile, a nickel-plated.38 caliber revolver, described as similar to that used by the killer, was found by two men about a mile from the gasoline station. The men were walking along railroad tracks when they noticed a metal object glistening in a nearby driveway. There was the potential for an unfortunate accident because the men believed the gun wasn't loaded. One of them decided to pull the trigger, luckily aiming it at the ground. You guessed it — the gun fired. The man finally checked for bullets and discovered the gun was loaded, but that two shots had been fired recently. The two men then did what they should have done immediately — they called Syracuse police, who sent the gun to a ballistics expert in Rochester for a determination if it was the weapon that killed James Bixby. That was the last mention of the gun, which leads me to believe it was not the weapon in question. AS THE CASE COOLED, things began to to get weird. Don Schultz, the gasoline station attendant who was held-up in the first robbery, was on duty July 26. A car carrying three men pulled into the station and Schultz was certain one of them was the robber. No crime was attempted; almost certainly no crime was intended. The man's presence was an odd coincidence and, for him, damn inconvenient. The man with the robber's face had been hitchhiking on West Genesee Street a few miles west of Solvay when he accepted a ride from someone headed east in an automobile that was running low on fuel. Guess where the driver stopped to fill 'er up? Schultz claimed the man jumped from the car and scurried away down Charles Avenue. However, he also said the man first thanked the driver for the lift. If this man really were the robber, he apparently didn't own a car. This, I believe, could have been an important point. THE CASE became more bizarre 11 days later when Schultz and a Solvay friend, Ray Pawlick (the young man who had taken Bixby to the hospital), went swimming at Snook's Pond, southeast of Syracuse, in Manlius. There Schultz noticed two men in the parking area in a small coupe. Schultz was convinced one of the men was the robber. He and Pawlick approached and engaged the two men in conversation. Neither of the men was interested in conversation, Schultz later told the Syracuse Journal, and neither did the would-be robber show any sign that he recognized the gasoline station attendant. With good reason, it turned out. When the two men drove away, Schultz and Pawlick followed them in their car for a mile or two, noted the license number, then set out for the nearest Syracuse police station. A check of the license number revealed the car was owned by a Baldwinsville resident. It was an interesting bit of detective work, but fruitless. Police questioned the man Schultz had identified. He was Joseph Pietrafessa, a Syracuse University student, who was quickly ruled out as a suspect. Earlier Schultz had identified a man named Harold Hilton as the robber, but the Rochester resident established he was nowhere near Solvay on Good Friday. Schultz's eagerness to help police would later make him seem like an unreliable witness. The state of journalism in Syracuse may have reached a new low on August 14, 1930, when the Journal published an account of a Margiasso dream. In the dream, he said, he discovered his shooter and Bixby's killer were one and the same. That remains a possibility, even to this day. Unfortunately, Margiasso never caught up with him. Or them. Weeks later a 24-year-old amateur boxer named Edward M. "Irish" Ostrander was arrested near his father's home in Kansas and brought to Syracuse, charged with shooting Patrolman Margiasso and Mrs. Alvone Dunham, an innocent bystander. The arrest was made largely on the basis of the victims' identification of Ostrander as the shooter, but the jury was more convinced by the young man's plea of not guilty and his account of his movements that evening, which did involve some time in Syracuse, but apparently not any speeding along South Salina Street. Ostrander had no previous record. Thwarted in a spectacular attempt to escape by leaping from a second-story window at police headquarters, Vincent Starowicz, alleged bandit leader, this afternoon sulked in a cell and threatened repeatedly that he would yet make a successful break for liberty. Over the next few months it became apparent Vincent Starowicz and his "leap for freedom" were not what they seemed. Starowicz may have been many things, including a bandit, but he would never be described as a leader. Starowicz had attempted his leap moments after he had identified Albert Sherwood, alias Thomas Norton, 32, of Utica, as his accomplice in a series of robberies. Starowicz was prevented from making his jump by motorcycle policeman John Forsythe, who had helped arrest the man after a robbery at an East Syracuse motel in which the owner was shot and wounded. Police soon decided the attempted leap was actually intended as a suicide attempt by Starowicz, prompted by fear when he came face to face with Sherwood. Starowicz would later implicate another man, Joseph Nedza of Auburn, briefly leading to Sherwood's release. However, all three men were soon convicted and sentenced to 40 years at Auburn prison. Three months into that sentence, Starowicz remained deeply troubled and frightened for his life. So he declared Nedza had nothing to do with the crime, that his only partner during the robbery was Sherwood. The baffling murder of James Bixby, 21, of 501 Montrose Avenue, Solvay, who was killed during a holdup of the gasoline station at Montrose Avenue and West Genesee Street on the night of April 18, 1930, apparently was solved today when Vincent Starowicz, serving 40 years in Auburn prison for an East Syracuse holdup, sent a confession of his guilt to attorney Irving Devorsetz of 1110 Hills Building. In his letter Starowicz declares his conscience has driven him to the point that he can no longer conceal his connection with the slaying and that he is anxious to pay the penalty for it as speedily as possible. Attorney Devorsetz immediately turned the confession letter over to District Attorney Unckless and Assistant Prosecutor Martin and county officials started legal machinery in motion to conduct a full investigation of the startling acknowledgment of guilty, which, if substantiated, will bring Starowicz to trial on a charge of murder in the first degree. 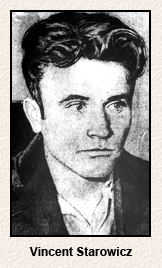 Starowicz then goes on to say that witnesses who failed to connect him with the Bixby slaying knew him and failed to identify him because they probably figured he would receive sufficient punishment for the crime for which he was then convicted and were reluctant to be the means of sending him to the electric chair. A page 2 headline credited Starowicz's lawyer as being the "CENTRAL FIGURE IN SOLVING 1930 MURDER AND HOLDUP." Beneath the headline were large photos of attorney Irving Devorsetz and shooting victim James Bixby. An article the next day in the Auburn Citizen-Advertiser revealed why Starowicz couldn't possibly have killed James Bixby. Starowicz was behind bars at the time, at Elmira Reformatory where he was spending a year for a parole violation. Police theorized the confession was a convoluted suicide attempt — pleading guilty to murder in the first degree in order to be sent to the electric chair. Warden Brophy asked that Starowicz undergo a mental examination. Joseph Nedza of Auburn, who now carried the nickname "Lucky" because of his release from prison in 1931, was arrested again in 1933 on a burglary charge. This time around police were suspicious from start, thinking he had been set up by the real culprits. In 1948 Nedza received $7,800 damages in settlement of a $50,000 action he filed for "erroneous conviction" in 1931 for which he served five months in Auburn Prison for a crime he did not commit. ATTENTION TURNED to another Joseph — Joseph Neri of Syracuse — who first made news in April, 1931, when he pleaded guilty of leaving the scene of an accident. He was sentenced to 30 days in Jamesville Penitentiary. By the time he was released he would find himself in more trouble — on two fronts. Who provided the tip, no one would say, but an investigation led police to believe the 21-year-old Neri was the man who held up several gasoline stations a year earlier. Donald Schultz and Charles Post were called in to look at the latest suspect in the robberies at the gasoline station at West Genesee Street and Montrose Avenue. Schultz and Post agreed — Neri was the man. Statements by Mr. and Mrs. Way apparently didn't carry much weight with the district attorney, who decided to charge Neri for only the first two robberies at the Solvay gasoline station. Neri was in prison when Bixby was shot, so he was not held responsible for that crime. AS IF THIS STORY couldn't get any wackier, Neri was out on bail in October. That's when he decided to marry a young Syracuse woman, Sophronia May Duquette. He'd soon learn she was keeping a secret. Mrs. Neri, only 21, did not appear to contest the suit, but submitted an interesting document as evidence. On October 8, 1931, three days after she married Joseph Neri, Sophronia wrote her own divorce decree and sent it to Myron Beach at 125 Hastings Place, Syracuse. Interestingly, in the 1930 census Myron J. Beach is listed as single and living with his parents. Anyway, I found nothing more about Beach's lawsuit, but in 1936 Neri asked for an annulment from Sophronia Neri on grounds his wife was bigamist, and he cited the 1928 wedding in Solvay as the proof. Sadly, none of this advanced the James Bixby case, which remains unsolved. 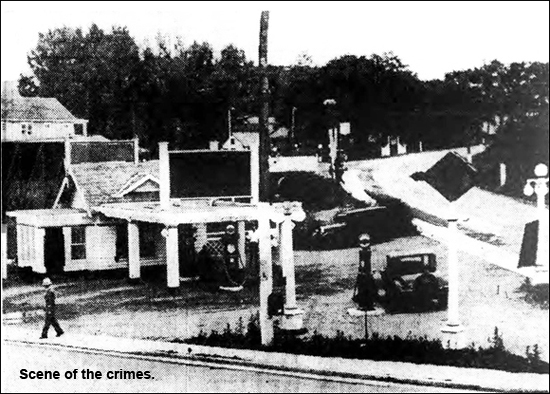 On August 30, 1932, the gasoline station at West Genesee Street and Montrose Avenue was robbed for the fourth time. Attendant Joseph Davidson offered no resistance in the face of a revolver, simply emptying the cash drawer of $25 and giving it to the armed man. In 1930 the intersection of West Genesee Street and Montrose Avenue was at the eastern edge of a rural area. There were a few nightclubs and speakeasies down the road to the west, and nearby on Fay Road, but to lots of folks this was the sticks. That would change after World War 2 when one of Onondaga County's first strip malls, complete with Solvay's prettiest and most comfortable movie theater, was built kitty-corner across the street from the ill-fated gasoline station. Although it was on the southern border of the village, it became downtown Solvay, though it lacked the bars that lined Milton Avenue at the northern edge of the village. Today the glory days of the Westvale Plaza and the Genesee Theater are long gone, though the plaza, at least, is still open for business. The theater closed many years ago. MY TAKE on the James Bixby murder no doubt is influenced by the fact I watch entirely too many police shows. I also was goaded by a column written by Syracuse Journal editor Harvey Burrill (August 14, 1930). Using the Bixby shooting as an example, Burrill made this comment, albeit about the Syracuse police force, not the others who were investigating the case: "It is clearly evident that officers are slow in responding and rather dumb in their actions." While police — particularly the state police — were looking toward Auburn, I thought everyone missed the obvious likelihood that the man they were looking for lived within walking distance of the gasoline station and was familiar with the people who worked there. I doubt whether someone from Auburn, Weedsport or even most areas of Syracuse could have been so specific about a location on West Genesee Street. Also, twice he had to escape on foot and wasn't seen, likely wouldn't have tried to hitch a ride on a busy street, and did not steal a car. I think he simply walked home. Finally, maybe the man who provided a ride in July stopped at the gasoline station because it was close to where the hitchhiker wanted to be dropped off. Maybe the hitchhiker wasn't the robber. Gasoline station attendant Don Schultz wasn't exactly spot-on as an eyewitness. The man who killed James Bixby is undoubtedly dead — or one of the world's oldest living men. Perhaps he served time for other crimes, perhaps he decided he pushed his luck too far and got himself a real job. And perhaps, during the many evenings I spent watching movies at the Genesee Theater, the murderer was munching pop corn in a nearby row.